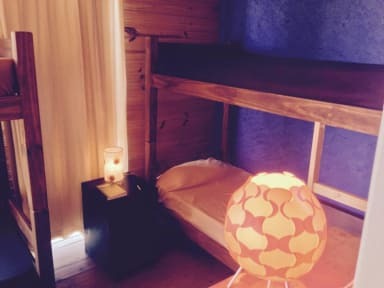 Deberá abonarse el 40% del total de la estadía después de reservar por hostelworld. Se deberá hacer un depósito de seguridad. The unpretentious rooms contain wooden furniture and lockers. Each features a shared bathroom and a fan. 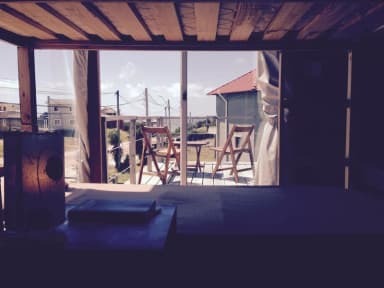 The property is found 600 metres from the centre of Punta del Diablo. The bus station is located 1.5 km away. Santa Teresa National Park lies 4 km away. Hostel Vente al Diablo offers free parking. Included in your rates: full breakfast, bed linen, lockers in the room and free Wi-Fi. There are 6 shared bathrooms in total. Large fully equipped kitchen with 3 fridges, freezers, microwaves, toasters, coffee maker, blender and tableware. Decks with tables and hammocks outside.BBQ. Ample outdoor space with lounge chairs, hammocks, garden with plants. Organic garden. Drinking water (Ose) and parking. Optional service: Spanish lessons (first class free), Yoga classes, towels, laundry, beverages and meals. Excursions: Black Lagoon, Santa Teresa park, Cabo Polonio, Valizas Ombues Mt. Horse rides. Check- in/ Check- Out from 8am to 22 hours. Muchas buenas ondes con este hostal. Hermosas personas. Bueno lugar antes del temporada. Un peu cher, mais très proche de la plage, super petit dej, ambiance surfer Par contre on nous donné une chambre de 4 qui EST DANS une chambre de 10 donc pas très intime, ni très safe mais sympathique.